This unique design allows almost any multi-tool to become a precise profile sander. Use this profile sander to do jobs that only could be done by hand in the past such as sanding contoured baseboards, antique window frames, plank edges or any other hard to reach concave or convex surfaces. This versatile sanding kit is ideal for detailed finishing work on most complex surfaces. This convenient and easy to use kit comes with a mounting harness for your multi-tool, starter sheets of sandpaper and 6 different attachment profiles. -1 metal casting harness mount. -1 Small radius convex rubber form block.-1 Large radius convex rubber form block.-1 Trapezoidal rubber form block for tongue-&-groove spaced items. -1 Flat nose rectangular rubber form block for sanding in between gaped spaces.-1 Concave rubber form block.-1 V-shape rubber form block for inside 90° sanding. 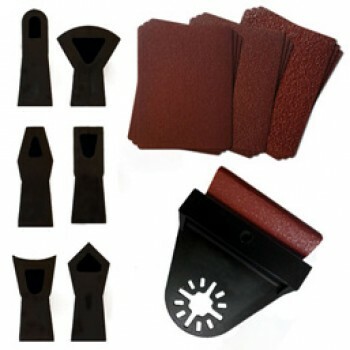 Use this sanding kit on surfaces such as wood, paint, varnish and on plastics. ATTENTION: Please only use this profile sander at the slowest possible speed on your multi-tool. Do not use this kit with fixed speed machines. TO OUR CUSTOMERS: Please only use premium cloth-backed sandpaper in this profile sander. Available in most hardware stores. (25-pack quantities of premium pre-cut sanding sheets with cloth backing are available for purchase on this same website). ATTENTION: When sanding please stop to check for sandpaper wear. If you don't keep checking you will sand all the way through into the rubber form block. Please have lots of premium cloth backed sandpaper on hand before you start any sanding project. This unique sander allows you to do jobs that could only be done by hand before such as sanding contoured baseboards, window frames, plank edges and other hard to reach concave, convex or gaped surfaces.